Day 1 of the blog tour is live! Check out Joyfully Jay for a post where Katey and I talk about writing a demisexual character and for an excerpt from the book. Make sure you sign up for the rafflecopter giveaway while you're there! 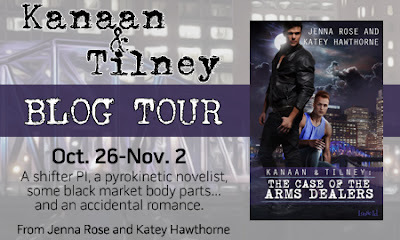 Also, don't forget that Kanaan & Tilney: The Case of the Arms Dealers is available for pre-order over at Loose-Id! If you order it now you get it 10% off!